Well, I’ve come to the end of the Julia Probyn series by Ann Bridge. 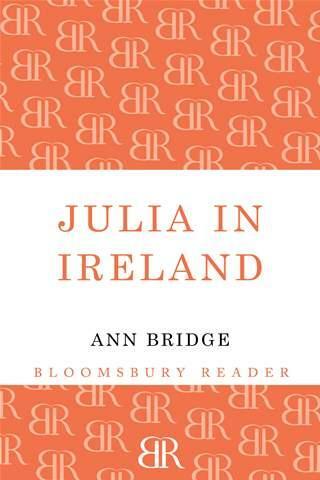 Julia in Ireland is the last book in the series, published in 1973, just a year before the author’s death. I’ve enjoyed the series very much & although there are no more Julia Probyns, Bloomsbury have also reprinted several of Ann Bridge’s standalone novels. Enchanter’s Nightshade has been recommended to me by a friend so that may be my next Ann Bridge. Julia in Ireland is almost a coda to the series. It’s quite different from the earlier books. There’s none of the espionage & excitement of the rest of the series in this book. It begins, as several of the books begin, at Glentoran, the Highland estate of the Munro family. Julia has been a widow for several years & working for British Intelligence in Morocco. She visits Glentoran accompanied by Gerald O’Brien who wants to marry her. Julia’s son, Philip, is being brought up at Glentoran & Julia, unsure about marrying Gerald, wants the two to meet. Gerald is aware of Julia’s indecision & wants her to visit his home in County Mayo before she gives him an answer. Julia goes to Ireland & stays with her friends the O’Haras, visiting Gerald at weekends. She becomes involved in stopping an unscrupulous developer from building a casino & hotel on an unspoilt part of the coast. In the process, she gets to know Gerald & to love the beauty of his home. She also, in typical Julia fashion, has lots of ideas for improving his home with her own furniture & pictures. Julia is still essentially Julia – confident, decisive, clever & determined once she has an idea in her head. There are some very funny scenes. Julia arrives to visit an old lady who has been inveigled into agreeing to sell her land to the developer. As she arrives, £5 notes are blown all over the drive. She gathers them up to find the crafty old lady trying to count the deposit she’s been given for the land. More idyllically, Julia & Gerald spend a golden day salmon fishing that helps her to decide what she really wants to do about his proposal. The Julia Probyn novels are an appealing mixture of suspense & travel. Julia runs rings around most of the people she encounters, including agents working for several countries. That’s what I love, the fact that in the 50s & 60s, there was a female heroine who was virtually James Bond without any of the silly gadgets & catchphrases. Of course, she does speak several languages & can drive any car ever made but she does it with such charm. Julia is always at least two steps ahead of the goodies & the baddies, organizing everyone around her & yet she’s not annoying, she’s just quietly efficient. She usually sorts out a few personal difficulties for friends & family along the way as well. Her uncertainty & diffidence when it comes to her own emotions is very appealing. It makes her more believable. I’m very glad I had the chance to make her acquaintance. Ann Bridge was a diplomat’s wife & lived all over the world. She used her husband’s postings as settings for many of her novels & her beautiful descriptions of place & history are testament to the fact that she just soaked it all in. Her books remind me of Mary Stewart’s novels of romantic suspense. Bloomsbury have just started reprinting Jane Aiken Hodge’s novels &, although I mostly remember her historical romances, I’ve downloaded Strangers in Company, which sounds more like a Stewart or Bridge novel. A woman on a Greek holiday encounters danger & suspense. I’m looking forward to reading it. I hope you enjoy the series, Susan.